There was a time Scotch was Scotch. Prior to the 1960s, Scotch drinking wasn’t about seeking out single malts, obsessing over distillery provenance and judging by age statements. The majority of Scotch on the market were blends, and that was a perfectly respectable thing to be. Now blends have become the exception to the rule, though they are starting to make a comeback now that age statements are disappearing from shelves. However, let’s forget age statements for now. The reason whisky, any whisky, is drinkable is all down to the way it’s blended. Even a single malt needs a master blender to select various whiskies from a distillery’s warehouse casks to create certain flavors - different levels of maturity, ones that matured at different temperatures, those that matured in different types of casks (new oak, ex-bourbon, sherry, port, etc.). It’s can be even more interesting when a master blender has at his/her disposal casks from a range of distilleries from different regions and the option to use grain whiskies to create a blend. 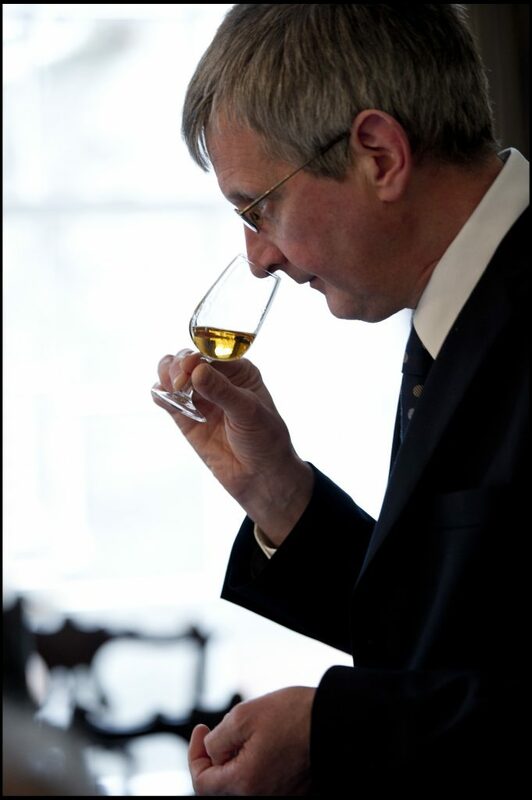 Dr. Jim Beveridge (the Master Blender with the name that seems written in the clouds) and Emma Walker at Diageo are some of those lucky people. Triple Grain American Oak from Johnnie Walker’s new Blenders’ Batch range is their latest project. The Blenders’ Batch is a limited edition series of experimental whiskies, and Triple Grain American Oak is the premier release from this series. The name refers to three grain whiskies - wheat, barley and corn - that join malts from Cardhu and Mortlach in the final blend. All of the whiskies in the blend are at least 10 years old, aged in American oak, including some of the grain whisky from Port Dundas distillery, which is now closed. The concept was to create a whisky that was cocktail and bar-friendly not only in flavor and texture, but price point (about $30 a bottle). Here, lead blender Emma Walker shares some insight into making a blended whisky such as Johnnie Walker Triple Grain American Oak. Amanda Schuster: The U.S. market has embraced Johnnie Walker blends for decades, even before single malt became a thing. Why is now the time to introduce a new series of blends? Emma Walker: This is a great time in whisky - changing consumer trends, a new generation of Scotch drinkers and bartenders who are challenging flavour conceptions and breaking boundaries. True to our heritage of innovation and experimentation, it feels like the right time to introduce the world to some of our own flavour experiments. Johnnie Walker Blenders’ Batch is a series of limited edition whiskies and an opportunity for us as blenders to draw inspiration from the world around us and create new flavours in Scotch whisky. Johnnie Walker Triple Grain American Oak is one such experiment inspired from my interest in American whiskey and the time I spent working on bourbons and ryes in Kentucky during the 1990s. We are excited to see the reaction to Triple Grain American Oak and with over a hundred ongoing experiments happening at any one time, we are excited about the future of Johnnie Walker. AS: Aren't the majority of Scotch blends aged in American oak? What spoke to you about these particular casks for this project? EW: Blended Scotch is a careful balance of flavours, combined to achieve the required high quality and character people expect. In a blend we will typically use a number of grain and malt whiskies, which have been matured in American and European oak casks. These oaks impart different flavour influences on the maturing whisky; maturation in American oak gives the resulting whisky sweet notes of creamy vanilla, toffee, coconut with a smooth mouth feel, while whiskies matured solely in European oak have notes of rich and dried fruit, raisins, dates, spice cake with a slightly drying, tannic mouth feel. The skill is to use the variety of flavour influences available to enhance a blend. When we created the first Johnnie Walker Blenders Batch whiskies, we wanted to undertake a detailed exploration of the influence of American Oak maturation on the character of Scotch Whiskies. In Johnnie Walker Triple Grain American Oak, each whisky has been aged for at least 10 years in American Oak casks, resulting in a uniquely smooth, sweet Scotch whisky with notes of fresh fruit and gentle spicy, smoke. This is something truly unique – an irresistibly smooth Scotch that is a study of the influence of grain whiskies and American Oak flavours. AS: This whisky is targeted toward the whisky enthusiast who also enjoys whisky-based cocktails. When choosing this particular blend, were there specific cocktails in mind? EW: When we make whisky we think from the bar back – about how people will enjoy it. 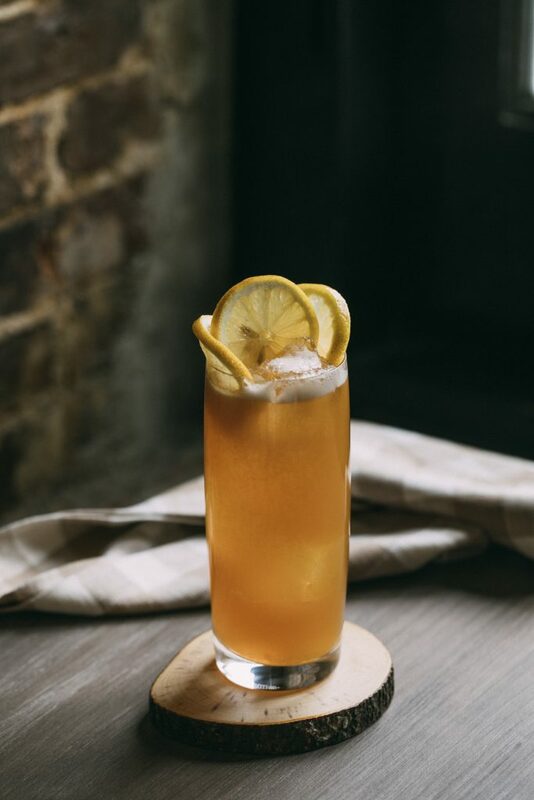 We consider bartenders to be an extension of the blending team – in creating new serves and cocktails, a bartender will think about flavours and ingredient combinations in a similar way to how we blend different individual whiskies. Triple Grain American Oak whisky was blended with [stirred] traditional cocktails in mind, such as a Manhattan, an Old Fashioned or a Negroni – we envisioned the sweet vanilla, fresh fruit and gentle spice flavours in the blend would combine well and be enhanced by combinations such as vermouth, bitters, sugar and citrus. The sweet spiciness would also work well in cocktails with ginger lead notes, and would work well served long with ginger or soda. With this in mind, we determined the optimal ABV was 41.3% - giving the best flavour balance, mouthfeel and finish, when served straight, with water or ice, but also supporting the longer serving styles. Put simply our intention is to give bartenders and drinks enthusiasts a world class blend, enabling them to create exciting drinks experiences. AS: I happen to be a big fan of grain whiskies since I think they add significant texture to a blend. As a blender, what properties do you look for when you choose a grain whisky? Do you build the blend around them or do you use them as a cook does spices to enhance what's already in place? EW: I have to say, I very much share your love of grain whisky. As mentioned earlier, a blended Scotch is a careful balance of flavours from grain and malt whiskies and different cask types. When we’re selecting grain whiskies, these will have been matured in American Oak as this balance works really well – sweet, toffee, vanilla notes from the cask perfectly balance and emphasise the light, sweet, subtly fruity distillery characters. Grain whisky can also help to reveal subtle characters in malt whiskies as they combine together and enables us to balance strong, smoky distilleries and rich flavours that come from European Oak maturation. AS: This is something I’ve been wondering for years: What happens to a whisky that doesn't make the cut for a specific blend? Does it have a chance at life in another blend or is it retired to a sort of whisky heaven? EW: For Johnnie Walker blends we can choose from more than eight million casks of maturing Scotch whisky, giving us a flavour palette like no other. So you could say we are very much in whisky heaven! It’s not so much about a whisky not making the cut. It’s more about timing and opportunity; allowing a whisky to develop and choosing it at the right moment, for use in the right blend, that is the real skill. Add all ingredients, excluding club soda, to a cocktail shaker and dryshake (no ice) to break up preserves. Add ice and shake again vigorously. Add roughly two ounces (60 mL) of club soda to shaker and strain over fresh ice into Collins glass. Garnish with apricot slices or lemon wheels.